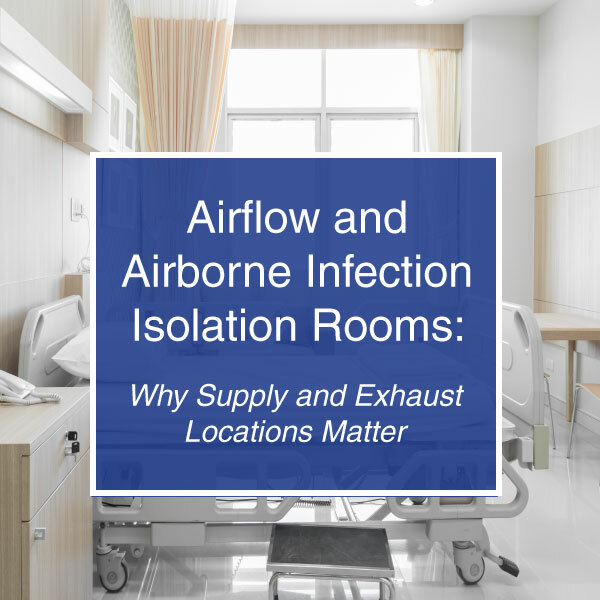 Airborne infection isolation (AII) rooms are negative pressure rooms designed to prevent airborne pathogens released from patients with illnesses like tuberculosis from recirculating in the air1 (read more on how TB spreads from the CDC here). It’s generally accepted that multiple air changes per hour aid in controlling the spread of airborne pathogens. Dr. Khankari published his study “Patient Room HVAC: Airflow Path Matters” in a recent edition of the ASHRAE Journal. Dr. Khankari utilized computational fluid dynamics (CFD) simulations to evaluate the impact of various HVAC configurations on airflow patterns, thermal comfort, and the probable flow path of airborne particles released from the patient’s face. His CFD simulations showed that airflow patterns can greatly differ from patient room to patient room, based on the placement of supply diffusers and return (or exhaust) grilles. Patient room airflow paths are complex, but with the right supply diffuser and return grille configuration, higher ACH can be a great asset in directing the flow of airborne pathogens, protecting healthcare workers, and providing a better healing environment for patients. You can check out Dr. Khankari’s air flow simulation graphics, along with his full article in the June 2016 edition of the ASHRAE Journal (must be a member to log in). So, where do Triatek products fit into controlling AII rooms? The FMS-1655 Room Pressure Controllers can control the air changes per hour, room pressure, temperature, humidity, and alert hospital staff if conditions change to create a safe and therapeutic patient room. 1“Air Change Rate/Dilution.” HVAC Design Manual for Hospitals and Clinics. 2nd ed. Atlanta, GA: American Society of Heating, Refrigerating and Air-Conditioning Engineers, 2013. 27. Print. 2“Air Exchange Rates and Ventilation.” Table 3-3. “Ventilation Design Parameters.” HVAC Design Manual for Hospitals and Clinics. 2nd ed. 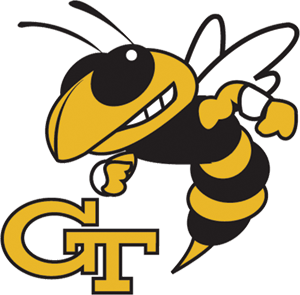 Atlanta, GA: American Society of Heating, Refrigerating and Air-Conditioning Engineers, 2013. 77. Print. 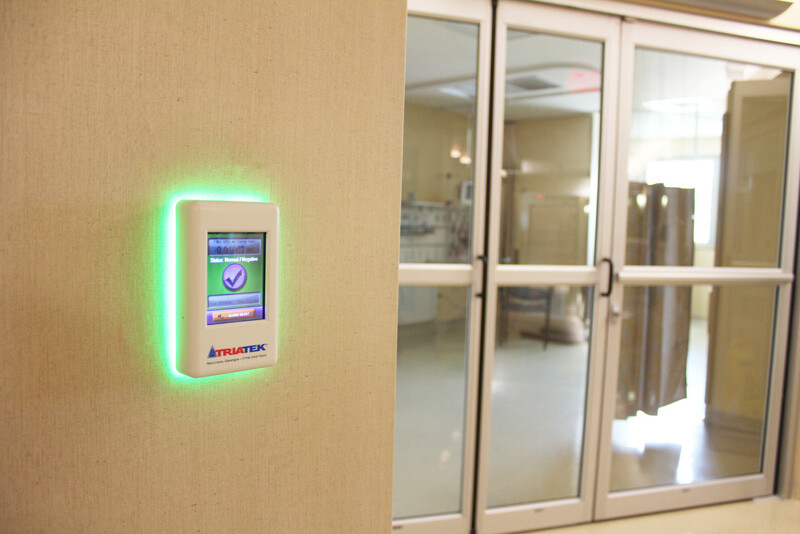 3“Air Movement and Pressurization.” HVAC Design Manual for Hospitals and Clinics. 2nd ed. Atlanta, GA: American Society of Heating, Refrigerating and Air-Conditioning Engineers, 2013. 32. Print. 4“Humidity.” HVAC Design Manual for Hospitals and Clinics. 2nd ed. Atlanta, GA: American Society of Heating, Refrigerating and Air-Conditioning Engineers, 2013. 30-31. Print. 5Khankari, Kishor, PH.D. “Airflow Path Matters: Patient Room HVAC.” ASHRAE Journal June 2016: 16-26. Print.